So while ‘community’ and in essence, connection, is on trend (and could easily be long forgotten if ‘fleek’ makes a come back), it has always been an essential part of our wellbeing because it helps us to formulate our identity. If you consider every group you have been a part, be it a family, work place, a group of friends or a sports club, you can trace the impact it’s had on your identity. Positive or negative, community gives us meaning and helps us to find direction in life. From the extrovert who is never alone to the recluse who avoids people at any cost, our behaviour directly relates to our past experiences of community. And after trust is broken or we experience a crisis in our lives, we begin to question the true nature of the community we belong to. Is this community harming me? Do I even want to belong to this community? And, can I make my community healthy? Even though these questions can be confronting, they are vital to nurture your wellbeing. Answering them begins with understanding what a healthy community actually looks like. Here are five signs your community is a nurturing and healthy environment. If ‘community’ is a buzzword, then ‘authentic’ is it’ cousin. Healthy community doesn’t take place without a group of people committed to being fearlessly authentic and vulnerable. That means there are no hidden agendas, people don’t feel they have to lie or make excuses, people feel free to talk about their ups and downs, and acceptance is shown for one another, whatever a member of that community is going through. Authentic community is challenging, and even the healthiest will have to continuously work at it. However, a good indicator you’ve found this is when you walk away feeling validated, known and understood. Forget these exclusive cliques that are created at high school and roll into adult hood, a thriving community is known for welcoming others in to its fold. So while a community is formed on common interests or relationship, it is built on different personalities, ages, ethnicities, genders, sexual preferences and religions. Each community group will naturally skew towards a certain type of people depending on where it is located and other environmental factors, but it’s willingness to accept all others is what makes it healthy. A healthy community will nurture its members. Often, this occurs through group outings, activities and celebrations. However, those that thrive take this a step further and empower its members to be outward focused. This means members are so energised by their belonging to the group, they actively invite and inform outsiders about it. Political or religious group are the obvious examples of this—members will often tell other people about their ideals or activities and provide their point-of-view about key societal issues their group has a stance on. However, this outward focus can also be subtler. A friend might invite you to a party and all their work colleagues are there. Someone just started a great new health program, and they talk about it all the time on social media and encourage you to join. Or they look for opportunities to support other communities to benefit the greater good. A healthy community digs deep and nurtures one another so it can extend this same bond to the outside world. Find a community that does this, and you’re on to something good. Acceptance is different to inclusion, because it involves actively doing life beside people who are different from you. It goes further than inclusion, because through it others are given a home and we invest in each other. Accepting people in your community is easy when we are like-minded. Many of us will feel a kinship with other members because of a common bond and interest. However, when we disagree about things—be it politics, religion, how to raise children or another member’s actions, things can fall apart very easily. A healthy community is willing to listen and learn from one another, even when members disagree on things. Instead of taking offence, they respond with empathy and love. Seeing a family member on the holidays is well and good, but what happens when they come to you with no place to live? What do you say to your friend at the gym when their marriage has just broken down, and how do you respond when a friend wrongs another friend, seemingly against the principles your whole community is built on? Healthy community isn’t easy, and we see this when its members make mistakes or are in crisis. When one person falls, a healthy community will do all they can to pick that member up, be it through a coffee, a frozen meal or a roof over their head. This is complicated when a member has actively broken your trust—for instance, by cheating on their partner, using all their money to fund an addiction or manipulating a friend. There is no one solution to this scenario. Some communities try to reconcile its members, others separate and many will ostracise that member until it’s clear they no longer ‘belong’. A healthy community will do all it can to understand and empathise with the member who has ‘failed’ and help them to recover without compromising their values. However, they will also protect and support the people the member has directly affected. 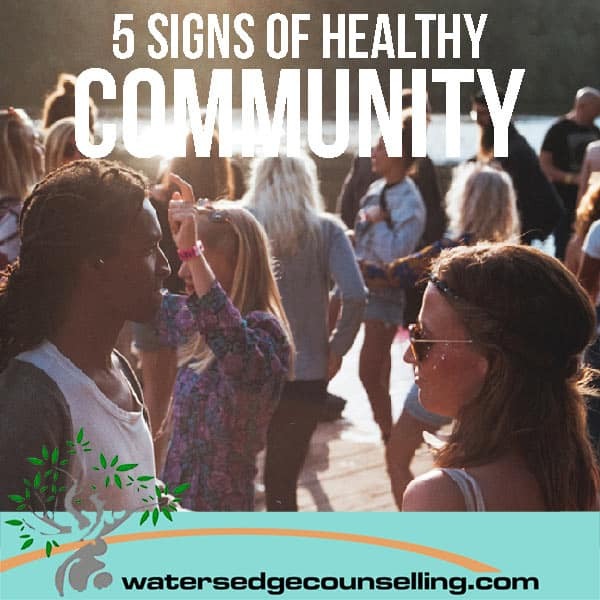 Ideally, a healthy community will see the warning signs that a member is struggling or beginning to compromise their principles, and help that person get back on track before anything major happens. This is why accountability is essential to a healthy community—it not only helps members to reach their goals, it also keeps them from falling. Do you want to find a healthy community? Would you like to learn how to better connect with other people? Here’s what you need to do: contact Colleen on 0434 337 245 or Duncan on 0434 331 243 for a FREE 10-minute phone consultation on how we can best help you, or press book now to book in our online diary.